So, any forest traipsers know the identity of these white berries? We ruled out mistletoe because rumour has it the kissing berries grow up high in trees, plus they're parasitical, and don't look quite like the plastic varieties sold in stores. It would also be good to know if they're edible or poisonous, in case one ever was starving in the forest in winter. Of course, if you were starving in the forest in Greenough Park, you're within a half hour hike out for a burger and heavenly fries at Five Guys. But if it were some other, non-urban forest, you might stay hungry until Search and Rescue finds you, but they'll probably only offer something on the tasteless side of nutritious. Which is why it's preferable to take your nature in local doses. 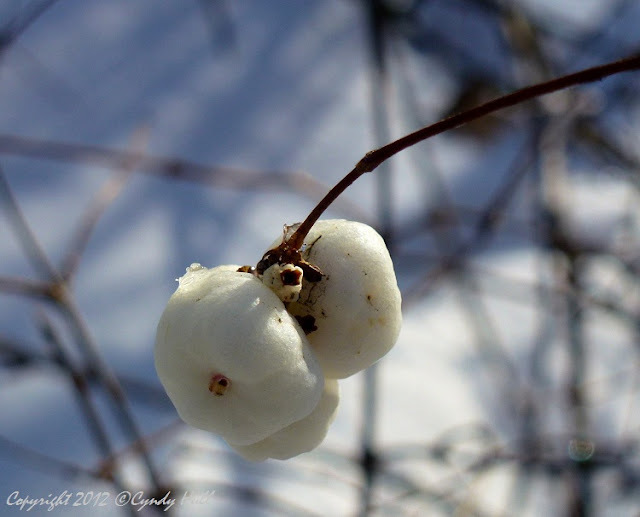 Update: 12/28/12: Per the comment below, here's link for info on the Snowberry! Update: 7/5/2017: Click here for a crazy-long list of what you CAN safely eat in the forest, thanks to a heads up from author/editor Colin at basisgear.com. I think they may be ammunition stores for elf snowball fights. (says wildlife can eat them - so, if you feel wild, I guess, snack away! Or just go for the "pop!" - who said you can't get no satisfaction? !